Manager John Hughes refused to be too downbeat after watching his Inverness CT team at Ibrox, ending their hopes of going one better in the Scottish League Cup this season. The Highlanders last term but could not get past Rangers to set up a third-round tie against Falkirk. 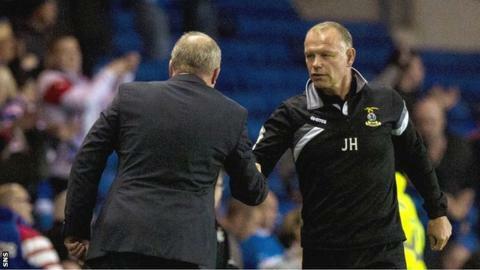 "In terms of effort and commitment and passing the ball, I can't ask any more of the boys," Hughes told BBC Scotland. "We gave Rangers as good as we got." Caley Thistle were limited in their attacks in the first half but improved after the break and the match looked like it could be heading for extra-time until Lewis Macleod's deflected shot sealed a win for Ally McCoist's men. "Getting to the cup final last year brought a great pride and sense of excitement to the club," added the manager. "I'm disappointed to lose the match but not in terms of the way we played. One goal wins the game and it could have fallen to us on another day. "Rangers are not a bad side. I think the Rangers team is settled now. All those boys have played in the SPL." "I thought we played some lovely stuff. One or two fell to Billy McKay and Blackie [Rangers midfielder Ian Black] got one off the line so that wee bit of luck is deserting us at this moment. "The final pass was the thing that was letting us down tonight." Inverness won four and drew one of their five Scottish Premiership matches in August, but with the loss at Ibrox following the league defeat at Partick Thistle on Saturday, they have lost both matches they have played this month. "Football's a strange old game. One minute you're up, the next minute you're down," said Hughes. "It's never a sprint, it's a marathon. Our remit is to get as many points as we can to stay in the SPL [the Premiership]. "Rangers are not a bad side. I think the Rangers team is settled now. All those boys have played in the SPL. "I look at my team and I think my boys dominated the football for long periods. A wee bit of belief in the final third was all that was missing."